eebee’s adventures are designed to engage you and your baby with rich play experiences that provide powerful lessons that memorizing letters, numbers, colors and shapes simply can and do not. Watching and, importantly, “doing” eebee’s adventures will allow you and your baby to see and learn first-hand what happens when you explore a crinkly, crunchy, smooth and bumpy paper mountain or roll, bounce, bop, bang, slide and toss your way around a world of balls and ramps. We know that when your child is playing, she is actively trying to figure things out about objects and people—why did that ball roll and the block slide? How did he do that? Why did that happen?… The questions, theories and solutions just continue to evolve as your child develops and masters a myriad of critical physical, social and intellectual skills—playing and learning about how the world works and he works in it. The research is clear that the best way for babies to grow and strengthen these skills—the skills they need to succeed in life—is to play. if the SHAPE FITS eebee is not an ordinary stacking toy. 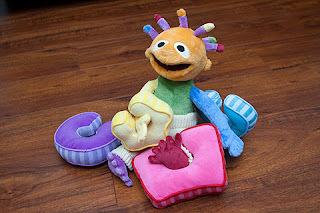 It’s a playful, interactive adventure with shapes, colors and sizes to stack, fit, share, compare and “wear.” Includes one 12″ eebee doll and 4 soft “wearable” shapes that easily slip on and off of eebee’s (and baby’s, parent’s, grandparent’s, play mate’s and sibling’s) arms and legs (hands, feet…). 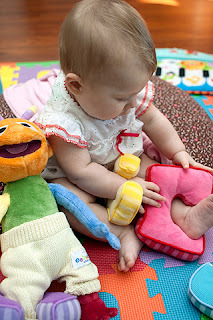 In addition to exploring color matching and exploring shapes and size relationships, if the Shape Fits eebee is the perfect toy for turn-taking, naming body parts, creating your own games and just getting silly with language and ideas. 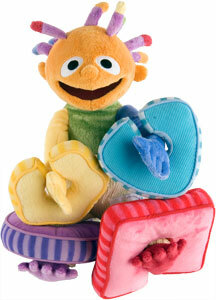 SHAPE FITS eebee is the winner of NAPPA GOLD award, a favorite baby toy in Parents magazine. The eebee doll is beyond adorable. With color coded arms and legs and a crazy head of ‘hair’ how could you not want to play with it? The doll is so soft and the 4 shapes that come with the SHAPE FITS doll are a perfect size to curl around my wrist or the baby’s ankle. My daughter loved playing with the eebee doll itself, but once I put the shapes on my own wrists her mission was so pull them off! My favorite part was putting the shapes on her and watching her figure them out and get them off. I can see how the SHAPE FITS eebee will be a great learning tool for colors and shapes, and even social interaction. This is definitely a doll that will be able to grow with Baby, much like the rest of the eebee product line. And I absolutely love the company’s concepts of learning through play and interacting with not only parents and the toys, but the DVDs, too. 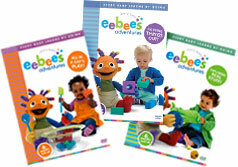 via Survey Junkie Review & Giveaways: eebee’s adventures: Shape Fits eebee Review & eebee DVD Set Giveaway.